Successfully Added 10.1 Inch TFT LCD Display - 1280x800 Native Resolution, LED Back Light, Built-in Speaker, HDMI, VGA, BNC, USB to your Shopping Cart. This 10.1 inch display portraits all media in stunning 800p resolution and can be used for numerous purposes. Coming with a BNC input this monitor is a great addition to your exciting security monitoring system as it can be connected to your DVR kit to display your live security footage in HD quality. Additionally, it provides you with a large screen on which to watch back and review previous recordings that have been saved on your DVR. With this magnificent LCD display at hand you can be assured that all your recordings will be shown in mesmerizing quality and sharpness, making it a true upgrade to your current security system. 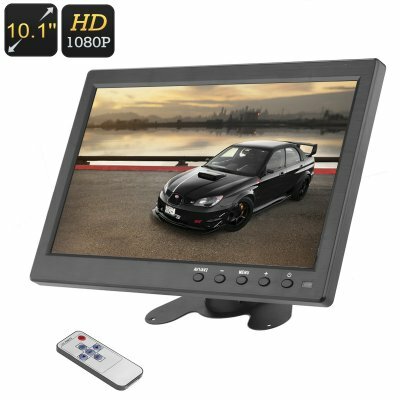 Alternatively, this 10.1 inch LCD display could be installed in your car where it can be paired with your in-car dash cam or rear-view parking camera. Coming with a bracket this HD display can be easily attached to your dashboard where, from now on, it will provide you with a clear picture of what is happening around your car. Additionally, it can be paired with your current in-car entertainment system or DVD player, providing you with an extra screen on which your passengers can enjoy all their favorite movies while waiting to arrive at the next destination. Featuring built-in speakers this display provides great sound quality to accompany the footage. With a backlight LED you will now be able to get bight and detailed images no matter the lighting conditions, making this display perfect to use inside your home or office but also in the car during a sunny day. With this 10.1 display you can be assured that, from now on, you can watch all your recordings straight away and in great detail on a large HD screen. Coming with its own little remote control you will be able to smoothly navigate through your recordings or adjust the settings without you needing to be within arm’s reach of the device. This 10.1 inch LCD display comes with a 12 months warranty, brought to you by the leader in electronic devices as well as wholesale electronic gadgets..
Arabic: - 10.1 بوصة كاملة عالية الدقة - Chinese Simplified: - 10.1 英寸全高清显示器 - Czech: - 10.1 palcový Full HD displej - Dutch: - 10,1 inch Full HD-scherm - French: - Écran de 10.1 pouces Full HD - German: - 10,1-Zoll-Full HD-Display - Hebrew: - 10.1 אינטש צג HD מלאה - Hindi: - 10.1 इंच पूर्ण HD प्रदर्शन - Hungarian: - 10,1 hüvelykes Full HD kijelző - Italian: - Display da 10.1 pollici Full HD - Japanese: - 10.1 インチ フル HD ディスプレイ - Korean: - 10.1 인치 풀 HD 디스플레이 - Malay: - 10.1 inci paparan HD penuh - Norwegian Bokmål: - 10.1 tommers Full HD-skjerm - Romanian: - 10.1 inch Full HD Display - Russian: - 10,1-дюймовый дисплей Full HD - Spanish: - Exhibición completa de HD de 10.1 pulgadas - Thai: - จอแสดงผล 10.1 นิ้ว Full HD - Turkish: - 10,1 inç Full HD ekran - Vietnamese: - 10,1 inch Full HD hiển thị.